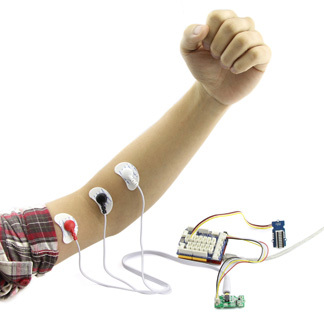 The EMG detector is a bridge that connects the human body and your microcontroller! The sensor gathers small muscle signal then amplifies and filters it so that the output signal can be recognized by an Arduino. You can add this signal into your control system. Note: The sensor cannot be used for medical purposes. In standby mode, the output voltage is 1.5V. When detect muscle active, the output signal increases, the maximum voltage is 3.3V. You can use this sensor in 3.3V or 5V system. When finish downloading demo code, it'll take about 5s to initialize, you should keep still when initializing. You can see that when initializing, the Led Bar will go form level 10 to level 0. When Led Bar All off, it is ready to be used. When you are moving, you can find that the level of Led Bar will change.